I was a little uncertain about what this book would be like. Probably the closest thing I'd come across before was Marcus Chown and Govert Schilling's Tweeting the Universe, which came across as one of those projects that works better as an idea than it does in practice. 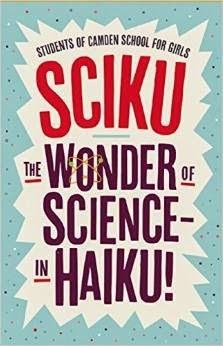 But, in fact, this collection of haiku on science subjects by the students of Camden School for Girls proved surprisingly enjoyable and thought provoking. One problem here is that I am not a great poetry reader - so it may be that my assessment of the quality of the work was a bit like asking someone who eats at a fast food joint every night what they think of a new Michelin starred restaurant. But I thought the quality of the writing, given the age of the contributors, was surprisingly good. You can tell from the desperation of my complaint about krypton that there's not much wrong with this lovely little collection, which would make a great gift or dip in book.